Prompts 'The Cosplay Kid' of the Comic-Con era of cinema to swallow the sins of our forefathers and the ones we countenance today. 149 min. Walt Disney Pictures. Director: Gore Verbinski. Cast: Johnny Depp, Armie Hammer, Tom Wilkinson, William Fichtner, Ruth Wilson, Helena Bonham Carter. Inevitably, Disney's new-millennial The Lone Ranger is a mass of contradictions, just like the country it's about. But it's hard to shake the feeling that director Gore Verbinski and executive producer Johnny Depp are getting away with something. Again. 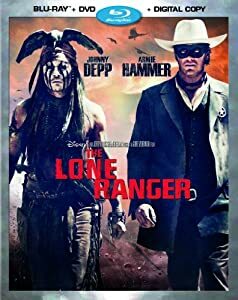 Like their collaborations on Rango and (albeit to a far lesser extent) the Pirates of the Caribbean movies, The Lone Ranger flaunts eccentricity and edge not commonly found in big-budget studio movies. Verbinski, Depp, and screenwriters Justin Haythe and Ted Elliot & Terry Rossio draw on a wide range of influences to create an action blockbuster that's as disturbing and melancholy as it is fanciful and fun. With a pointed framing device, the movie initiates its own conversation on the necessity of a postmodern Western. In 1933 San Francisco, before the backdrop of a half-constructed Golden Gate Bridge and an escaping red balloon of innocence, a little boy (Mason Elston Cook) walks into a Wild West Exhibition and up to an exhibition labeled "The Noble Savage in His Natural Habitat." The boy, dressed in full Lone Ranger drag, has obviously enjoyed many a playground round of "Cowboys & Indians," but the image before him is no wax dummy: in a bit of magical absurdism (by way of Little Big Man), it's a hundred-year-old Tonto (Johnny Depp), who proceeds to tell his story to a confused child that is the audience's surrogate. From living monument to Monument Valley (the Utah location that's the West of our collective dreams—subbing here for Texas): the 1869 inset story kicks off with an action sequence that shackles (a la The Defiant Ones) Tonto to John Reid (Armie Hammer, well cast). He's the man who will become The Lone Ranger—but not before we see him reading John Locke's The Treatises of Government and averring, "This here's my Bible." Reid's arc will be one of disillusionment, passing through rapacious greed and political corruption (and the lie comically being put to the thought "The United States Army. Finally, someone who will listen to reason") to arrive at the conclusion "If men like him represent the law, I'd rather be an outlaw." Now I'm not saying The Lone Ranger is an art film, or one that holds some definitive moral high ground, but there is more complexity in this popcorn fare than one might imagine is allowed. That's partly true because this pop-culture reboot—a result of Hollywood's current default position—operates in large part as a deconstruction of its source material, including the Lone Ranger's historical trust in government, and Tonto's nickname for him, "Kemo Sabe." What used to mean "trusty scout" now means "wrong brother," a gag that punnily evolves in meaning from distrust to "brother from another mother"hood. In sun-cracked white face paint and with a dead crow perched atop his head, this Tonto is both a typically oddball Depp creation (graced with the actor's studied deadpan), and an embodiment of the sane insanity of the unfathomably victimized: if he's a fool, he's a holy fool, leading the buffoonish Reid to understand his own victimization by the powers that be. Plenty is wrong with Verbinski's movie, with its wheel-spinning plot going on far too long while still feeling obliged to shunt its women (including Ruth Wilson and Helena Bonham Carter) to the margins. Depp's talent aside and the actor's unverified claims of Native American heritage to the contrary, I wouldn't blame anyone for taking offense at what might fairly be called "redface." And there are the twin ironies of countenancing and glorifying extra-legal violence (a stickiness keeping company with most latter-day Hollywood actioners) and the way this Disney behemoth points out how "sickness of greed is strong." But such ethical ironies don't quite seem lost on creatives who obviously hope to beat the system while availing themselves of its giant scale. Along with the shovelfuls of sugar that are some pretty spectacular action sequences, this "Lone Ranger" prompts "The Cosplay Kid" of the Comic-Con era of cinema to swallow the sins of our forefathers and the ones we countenance today. Disney brings The Lone Ranger home in a Blu-ray + DVD combo pack special edition that excels in the A/V department. The hi-def video beautifully resolves the picture as seen in theaters; eagle-eyed videophiles will notice some ringing, but that's very much the exception in a transfer defined by its perfect contrast and color calibration, as well as its exceptiontional detail and texture. The inky black level anchors the image, which has a film-like character. The DTS-HD Master Audio 7.1 surround mix quickly proves thunderously potent and pinpoint detailed: each effect is rendered crisply and placed with precision in the soundfield. LFE often rumbles to life, and rear channels are put to use constantly. This is reference-quality stuff to show off your home theater. Perhaps to the film's unenthusiastic reception, Disney hasn't arranged a commentary track here, but we do get a few nice featurettes. In the behind-the-scenes look "Armie’s Western Roadtrip" (14:37, HD), peppy star Armie Hammer talks us through his production "roadtrip," with producer Jerry Bruckheimer and director Gore Verbinski, through Colorado, Utah, New Mexico, and Arizona. "Becoming a Cowboy" (8:03, HD) finds Hammer and co-star Ruth Wilson put through their paces with shootin', ropin', and ridin'. "Riding the Rails of The Lone Ranger" (10:39, HD) wins best in set for showing us where all the money went. Even after having their budget negotiated down, the Lone Ranger team knew where to put the dollars for maximum movie showmanship: into building five miles of authentic railroad and designing explosive stunt gags. "Deleted Scene" (3:49, HD) details a trimmed sequence with old Tonto, recreating it with storyboards, pre-vis and bits of shot footage. Rounding out the set is a most-welcome reel of "Bloopers" (3:51, HD). Those suitably charmed by The Lone Ranger (myself included) will enjoy this fine home-video release. Now if everyone just buys five, maybe there'll be a sequel. All site content © 2000-2019 Peter Canavese. Page generated at 04/20/2019 09:24:30PM.